Need Holiday Cards for Gamers? It’s that time of year! you go to the greeting card isle and there is every Hallmark cliche’ and nothing for the gamer you love! At FailSquadGames and Lloyd Metcalf Inc. that problem is SOLVED! Not only can you grab Santa vs the White Dragon Postcards, but “The Giant Holiday” greeting cards. Santa vs the white dragon post cards are 10 for $10.00 that’s $1 each when you buy the 10 pack bundle! The Giant Holiday cards are 5 for $10, just $2 each! Click here to shop cards NOW! Not good enough for your elite tabletop RPG gamer? 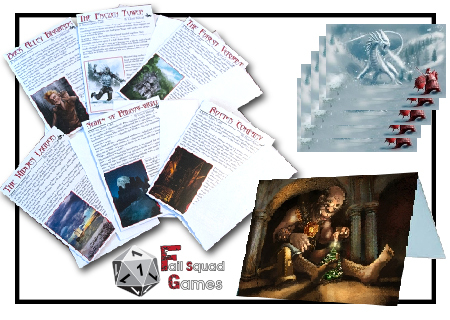 First Edition / OSRIC RPG ADVENTURE in greeting card form! Normally $3.00 each, now you can get ALL 6 adventures for $15! These cards feature hours of adventure squeezed into all 4 panels, front and back of each card. New monsters, new magical items, new adventures! Don’t muck up greeting cards with sentiment and poems no one reads!! Send ADVENTURE!! SHOP NOW for the RPG Gamers in your life! ← Get the original #1!